Robert Mueller’s investigation is finished, and based on what little we know so far, it’s hard to disagree with its findings. If we value the rule of law, we’ll accept them. We’ll also understand what those findings are. They're not a “complete and total exoneration,” no matter how many times the president says that they are. Mueller was asked to determine whether Trump or anybody associated with his presidential campaign knowingly conspired with Russia to affect the 2016 presidential election. The investigation didn’t find evidence – evidence that meets legal standards – that he did. 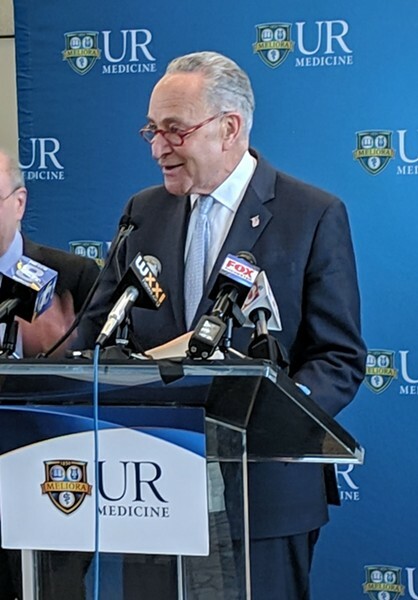 During a press conference at University of Rochester Medical Center, Senator Chuck Schumer called for the release of Robert Mueller's report on his investigation into possible connections between President Donald Trump's campaign and Russia. Schumer held the press conference to call for continued federal funding of a URMC opioid treatment program. Trump may have conspired with the Russians. He may not have. Given what we learned through indictments during the investigation, it’s hard to tell. Just because Trump was happy with what the Russians were up to – just because his family and campaign staff knew some of what they were up to – isn’t proof that any of them conspired with the Russians to have them do it. Mueller’s team didn’t find proof that they did. True to form, the president is crowing. That’s a distraction. And I’m not sure what the Republicans are cheering about. As a result of the Mueller investigation, the following have been convicted or pleaded guilty to federal crimes: Trump’s campaign chair, deputy chair, and foreign policy adviser; his national security adviser, and his personal lawyer. A longtime aide is facing charges of obstructing justice and lying. And the investigation found that Russian operatives did indeed try to interfere in the 2016 presidential election. We have plenty more to worry about, too, including Trump’s continued infatuation with Vladimir Putin and other dictators. Congressional Republicans ought to be just as worried as the Democrats. And while the Mueller investigation has ended, other federal and state investigations will continue, involving campaign finance, fundraising for Trump’s inauguration, his real estate practices, his foundation, and possible violations of the Constitution’s emoluments clause. Congressional committees are investigating Trump’s connections to Russia, possible obstruction of justice, and other issues. Those will play out, for better or worse. And what the Democrats do over the next months – in Congress and in presidential campaigning – will be as important as what the Republicans do. On Sunday, House Speaker Nancy Pelosi and Senate Minority Leader Chuck Schumer called for the Justice Department to release the Mueller report in full, and Schumer repeated the call Monday when he was in Rochester. Yes, of course, the public should see the report. Fortunately, the fervor for impeaching Trump is apparently dying down. Pelosi is right: The Republican-led Senate won’t convict Trump. If Democrats push for impeachment, not only will that infuriate Trump voters but many other Americans would see it as a waste of time designed simply to insult the president. And this would take place as campaigns for the 2020 presidential election take shape. Whenever it ends, the Trump administration will leave the country facing a crisis in everything from foreign policy and the environment to Americans’ trust in government and in one another. We won’t meet those challenges if we can’t overcome our distrust in one another. And as he has shown early this week, the president doesn’t seem interested in helping overcome our distrust. This is not a happy time.